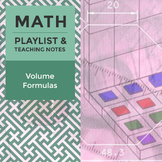 This sheet has the formulas for area, surface area, and volume. Images are included to help students identify the correct shape as well as the dimensions. 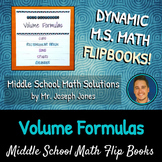 This is the perfect addition to any interactive notebook to introduce or reinforce the basics of volume. 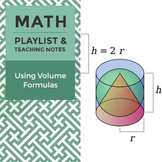 It discusses what exactly is volume, what units to use, and most importantly how the two different volume formulas--V=Bh and V=lwh actually work. 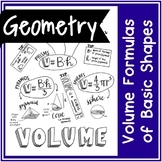 This is a powerpoint to help students review using volume formulas. This includes using formulas for a rectangular prism, cylinder and a square pyramid. 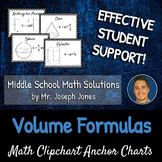 Good Review after you have taught what volume is. A graphic organizer/ Fold-able for the Volume in Unit 2 of Common Core for Math 8. With Examples already in the organizer. Formula sheets for area of parallelograms, triangles, trapezoids, circles, and semicircles; circumference of a circle; and volume of rectangular prisms, triangular prisms, and cylinders. Formatted for three lists on a page. 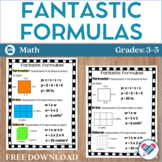 This is a graphic organizer for students to fill in, so that they have all formulas for area (of plane figures), surface area, and volume of solids all in one place. The teacher's key is included. Would you like to see more of Wisewire’s educational resources in your school? Help your administrator register your school to get started (it’s easy and free). Earn a $50 coupon while you’re at it (available to use in the Wisewire Marketplace). Register Your SchoolStudents explore standard HSG.GMD.